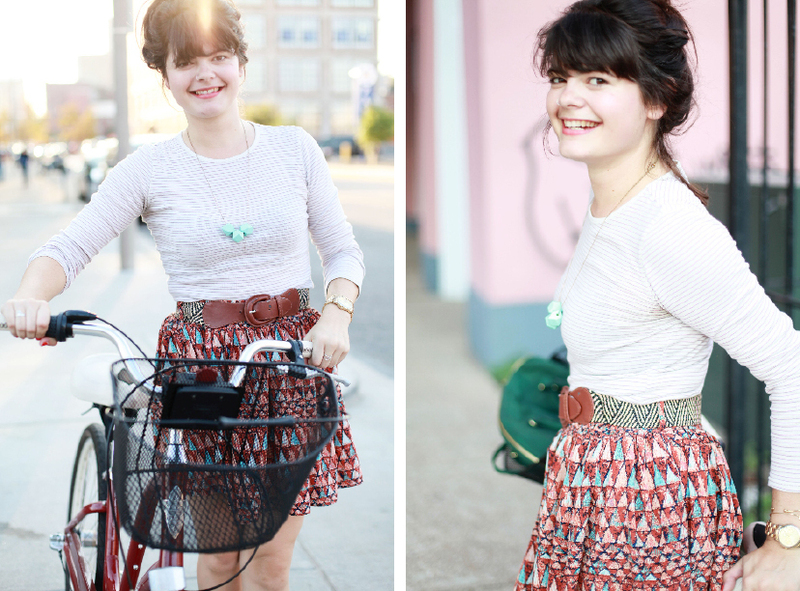 A couple weeks ago I joined the uber talented group of women who ride bicycles in skirts. But only for like, four minutes – it’s hard to be lady like on a bike. In the early fall I appreciate the ease of slipping into a long sleeve (striped) tee, a fun skirt, and throwing on some booties. I’m out the door in minutes, and I look pulled together. What makes this particular outfit even more fantastic, is the lovely geometric necklace by Fable and Lore. And because Chelsie is so very wonderful, she is giving away one of these necklaces to a lucky reader. They are crazy versatile – I seriously wear mine with everything. As an added bonus you can use the code CITYINAJAR to get 20% off any color in the geometric style necklace from Fable & Lore! Happy shopping. 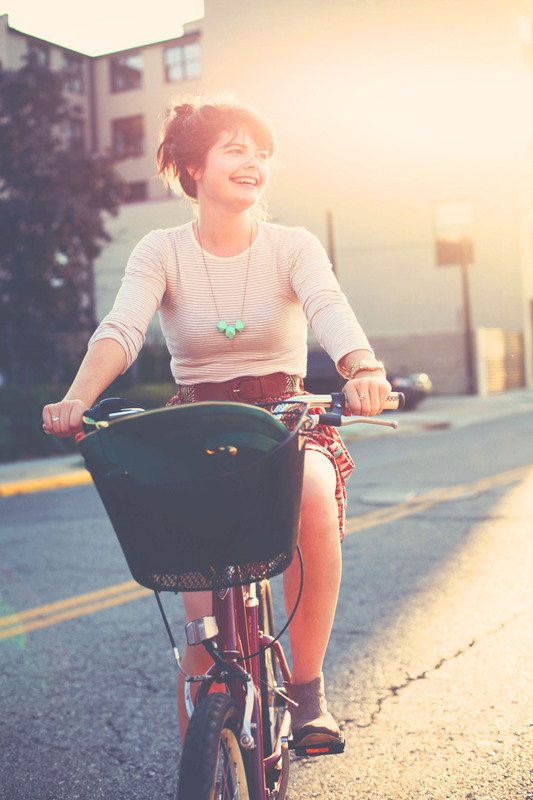 Wear it: on a bicycle ride! I love the Onyx geometric wood hedron! Well, it is quite obvious that I was obsessed with your necklace. Too bad I didn’t wait and get 20% off..shucks. I would get mint green if I won. I have the tri-color one and love it. I love the sky blue but the mint green is fabulous too. I love those necklaces. They remind me of the many sided dice used in D&D back in college. Wow, nerd-out much? Shoot. I can’t decide. I love them all! Really love the chocolate wood and gold, but I also love the onyx…and the sky blue. Ah! Mint green is amazing. 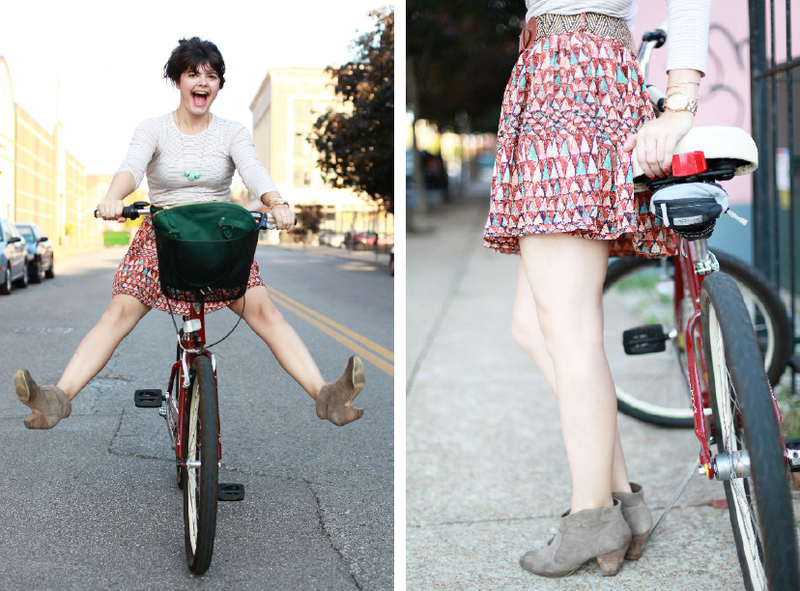 And skirted bicycling is THE BEST. OMG Aqua, Gray and Yellow! So cute!! Jet Black – the onyx. Perfect neutral + edgey. love all her stuff!! esp the chocolate & gold! Aqua! Gray! And yellow! Oh my! Love that skirt, btw. Onyx geometric wood! So pretty! I love all the colors especially the wood onyx. Fab for any piece for fall! Ooh, the Onyx and Autumn Modern ones are so pretty!! I love Fable and Lore! I’d have to go with the Autumn (wood) color – OH! Or the mint green… OKAY if I have to pick ONE – Mint Green. For sure! Ohh…love the Onyx and Autumn…and Mint & Sky! Gorg. Jess! 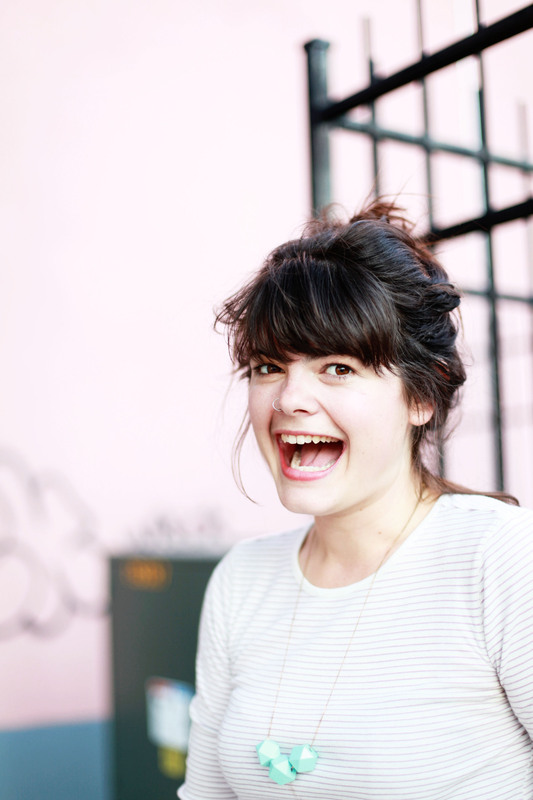 This blog is so great, I love how you make STL and fashion embrace each other in a big, warm hug. It is funny that your post is about your necklace…..I believe you were sporting that fine thing when I saw you at Bottleworks, no? Your color is great, I would flaunt that color or also a different green/blue shade! Not to mention, the suede boots in your photo shoot were the perfect tie in with that outfit-I too own those exact pair and love to wear them whenever I think it the responsible thing to do. 🙂 I have the tri-color greens but I think the wood would be the next one I would want! I’m gonna do the 20% off cityinajar right now though lol yayyyyy! The natural wood color is my favorite! The natural wood is my favorite! The aqua grey & yellow is awesome! The autumn color trio is perfect! Yay! I’ve been looking at her necklaces and have been having the hardest time picking my favorite! I think it’s a toss up between the onyx and the mint green. Thanks for the giveaway—and the discount code!